Saturday again and so off I went, camera in hand, for the weekly pilgrimage out to the land to see how close we are getting. Dear Husband spent all day with a friend clearing out the shed bay that hasn't been walled in so our (slightly primative) bathroom can go in there. From the outside it doesn't look much different. The capping has gone on along the roof line and the edging around the windows (I have NO idea of the official building terms for those). But inside......big changes! 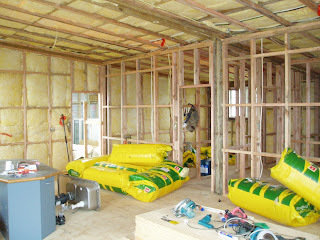 The electrician has been and done the initial wiring and all the insulation is in, now waiting for the internal cladding. I think my progress shots are now all going to be taken inside. Dear Son has decided that he would like his walls painted red. He also wants red curtains. And half blue and half red drawers. I'm beginning to think his favourite colour is red! And while he is busy planning his bedroom, I'm busy dreaming of my vege garden. 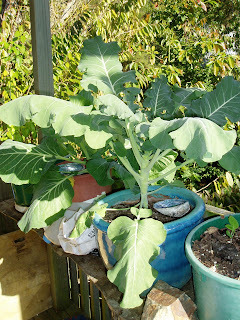 I get a weekly newsletter from Lynda Hallinan, the editor of New Zealand Gardener magazine. She set herself a challenge to be self-sufficient out of her garden for a year and only spend $10 a week on groceries. Very inspiring, and very useful for people like me, who have only gardened on a small and casual way! And this has to be one of my other fav gardening sites, Koanga Gardens, Center for Sustainable Living. Kay Baxter, who used to be one of the mainstays at Koanga, has written two amazing books which I wouldn't be without: "The Koanga Garden Guide" and "Design Your Own Orchard", both are available from the Koanga site. They are both amongst the gardening books that I am immersing myself in at the moment, planning and dreaming with growing anticipation for when we move. I'm soooo looking forward to having space to garden in a productive manner, but in the meantime I thought I'd show how I keep my thumb tinged green. We live on an acre section. Sounds huge, huh? Plenty of room for gardening, so what am I whinging about? Well, it's an acre of land that sits at about a 45 degree angle! And it is 80% covered in regenerating native bush. The only real flat bit is the driveway! The soil is solid clay too, so backbreaking stuff. But I have a huge deck. So pots it is. Lots of pots. Oh, and a bath. No space for a bath inside, so lets make use of it somewhere else! It took about two sacks of potting mix and one of compost for the bath and if I was doing it again, I'd put in another sack just to get a bit more depth. They do take a bit of watering in summer, but I empty the kids paddling pool into the pots as one method of saving water. Then I put a plastic basin in the bottom of my kitchen sink and it collects vege washing water, dish rinsings, hand washings and cloth washouts. Before you know it, you've collected 15 litres a day! 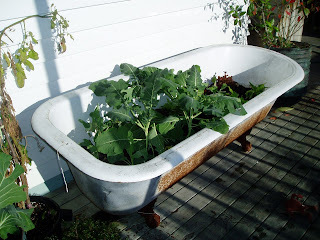 I grew green beans in the bath in summer. 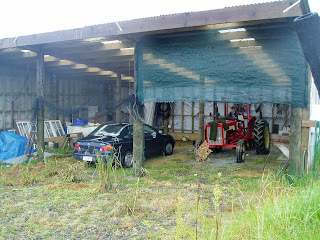 I hung strings from the shade sail rafters and had three plants at either end and lettuces in the middle. 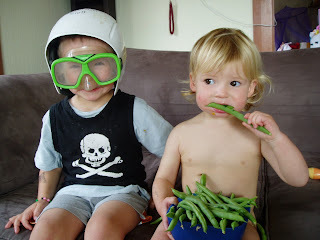 The photo of the kids is just one days collection of beans. I was AMAZED at how many beans I grew. (Actually I was amazed at how many beans I grew with the lack of attention I gave them!). And what keeps my garden growing? Certainly no silver bells and cockle shells. Nope, just good old excrement, otherwise known as vermicast, or as my kids call it, worm poo!! 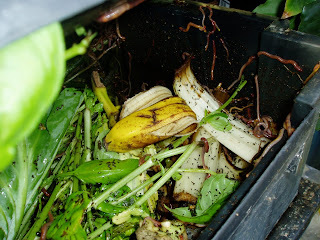 My worm farm gets vege scraps that the chickens won't eat. And that's enough to keep them ticking over and giving me a container load of vermicast every six months and a couple of buckets of worm wee too. I dilute the liquid with water till it looks like tea and give them that every week or so and then when I pull out plants I mix in vermicast before I plant new ones. For nitrogen loving plants sometimes I'll go scrape up some chook poo from under their night perch and mix that in too. And there you have it. Mini gardening. It certainly doesn't give me enough to not need to buy veges, but it does give us some. And it keeps my enthusiasm up. Great for the kids to help with too. They love the harvesting bit - especially cherry tomatoes and blueberries! My kids like raisins. But preferably the raisins in the little cardboard packages. 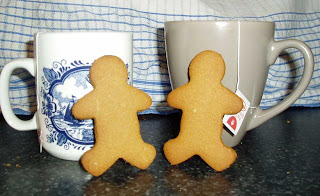 I am a scrooge, sorry, frugal mum, and don't like spending the money on the little cardboard packages. So now I fool my kiddies. I keep the little cardboard boxes, refill them with bulk bought sultanas (which are cheaper than raisins, and hey, they are all grapes, right?) when they aren't looking and hey presto, they are ready for the next round of snacks! And the funny thing is, they eat them with exactly the same enthusiasm as they do the 'real' ones! What clever marketing person came up with the little cardboard box idea? And they don't even squeak when you blow in them anymore, like they used to when we were kids. 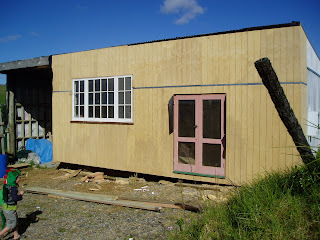 So it's been four weeks since the transformation of our shed began. Today, and what a spectacularly sunny autumn day it was, Dear Hubby picked up a second hand kitchen that we bought and we delivered it out to the shed. And here is the progress that greeted my eyes. Oh. And the little green gremlin in the corner? That's a dragon costume from the Toy Library. I love my Toy Library (and so do the kids!). I have to write a post to say 'thank you' to all the wonderful sponsors who helped get our International Day of the Midwife raffle get off the ground and fly! The Independent and Core Midwives all got together and grew this project and I think it really helped to bring us together as a group. 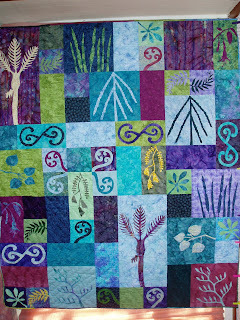 I designed the quilt that we made and then we had a couple of really great sewing nights - lots of giggles and chatter. We also individually took on bits of the organising and sewing too. Thank you to 'The PowerQuilter', our local shop, who donated the sumptuous Signature thread for the quilting. 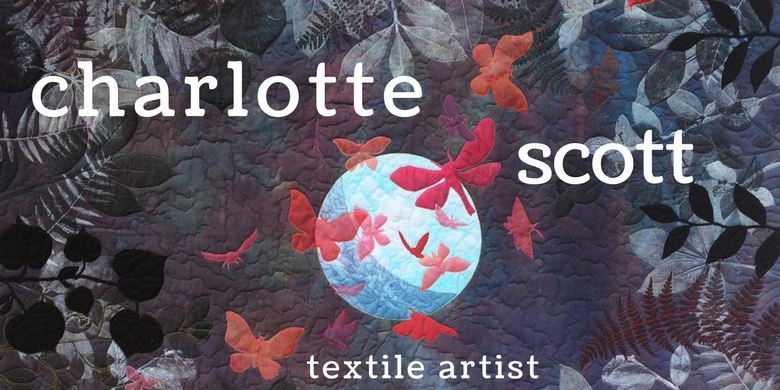 Thank you to 'Spotlight' in Whangarei, who generously donated the batting for the quilt. Thank you to Lindsay Hurkum, Osteopath, who donated a free treatment. Thank you to Pamela Gillies, Bowen Therapist, who also donated a free treatment. Thank you to Harvies, who donated a fabulous garden gift. Thank you to Northland Limousine Services, who donated a fun Limo ride. And a big thanks to Avalon Resort Cottages, who donated two nights accommodation. 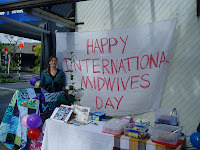 It was a fun thing to do and we raised over $700, which we are hoping to send to the Solomon Island Midwives Association to help them support and develop midwifery. We gave away LOTS of cake to passersby and got talking to the public about what midwives do etc etc. And we had fun too!! I have to say, I'm glad it's over. It was a lot of organising, but it was a great success and worth the effort. I got blueberry pancakes for breakfast - yum! My darling husband heats up frozen blueberries with a bit of sugar and then spreads this on the pancakes. This way you really get to taste the blueberries rather than all mushed up in the pancakes. Mmmmm........and watching the two wee ones turning their mouths blue and saying,"More, more!" is good entertainment at breakfast time. Then my best present was four childfree hours. Funny how on a day celebrating mothering, all I wanted to be was childfree! But this way of being childfree isn't like when I have them in daycare for a few hours. When they're with their Dad, I never worry that they are being psychologically damaged or neglected (I might worry that they're eating junk food!) but I know that they are with a person who is entirely devoted to them. So I can really enjoy myself, guiltfree. And of course, I sat down and sewed till I didn't want to sew anymore. Which is a very, very rare occurrence. I worked on a lot of WIP's - works in progress. Many people call them UFO's - unfinished objects, but I get a complex about never finishing anything so WIP's they are. I've been stalled for a while on a blue and white quilt top that needs setting triangles because the blocks are on-point. Because I had all the time in the world, I found this little tutorial for working out how big to cut your setting triangles. Happy Mother's Day everyone (a little late I know). I hope you Mum's had a wonderful day however you and your whanau celebrated it. My Mum died almost 15 years ago so it is a day tinged with a little sadness, but it makes it all the sweeter to know that I have a wonderful Step-Mum and I know so many Mother's out there who are working day-to-day just being the best Mum's they can. 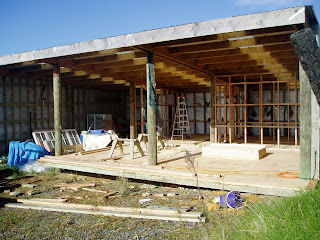 So two weeks ago, my new house looked like this. 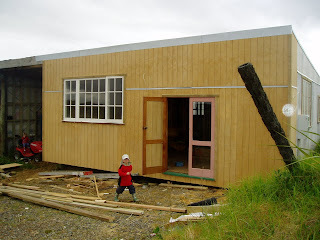 Yes, we have a floor and a couple of bedrooms for the kids all framed up. Wow! It is actually going to happen. It is kinda scary when I look around the house that I am in and contemplate packing it all up. So I'm hooking into the FLYlady's theory on decluttering and her other theory on 15 minutes at a time. FLYlady is a bit over the top for some people, but I've found she has got some good ideas and my house and life are definitely more organised since finding her! The 15 minute thing is just that you can do ANYTHING for 15 minutes. It keeps you focused and stops you whining. I use it all the time when I don't feel motivated, or have lots to do and don't know where to start, or even just to make sure I don't spend too much time on the net! I just set my kitchen timer (or the one on my computer) for 15 minutes and get stuck in. If I have lots of tasks and want to procrastinate by quilting, I quilt for 15 minutes, work for 15, quilt for 15, work for 15.......get the picture? I told you in the beginning I wasn't that flash at all things computery. For the life of me, I can't figure out how to fix those links in the previous post (enourmous eggs). Every time I edit it, the link still puts the blogger address in front of the other address. So if you are giggling at me right now, please enlighten me! Check this out!! Routine collection of eggs today and there it was. My poor hen, that must have been like pushing out a 15 pound baby. But I couldn't see any of them limping so.... no stiches required! (or intact perineum as we say in the midwifing business - hmmm, do chickens have perineums?). 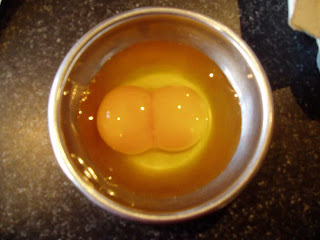 Anyway, I just had to crack it open and sure enough it was a double yoker. These do not normally develop, but I have heard a few stories of twin chickens. 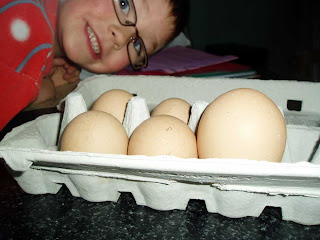 Check this link out for an assisted twin chicken birth. In this eggs case, even it had been fertile (I have no fully grown roosters at present), it wouldn't have survived as the yolks are partially joined. Because I don't normally have roosters, when I want more chooks I buy in fertile eggs and put them under a broody hen. All going well, 21 days later I have cute fluffy little babies. I often buy a mix of purebred eggs. This can be a great way to try out different breeds and is often a good way to get expensive breeds cheap. How? Well, breeders usually sell eggs in dozens or half dozens but if they have some extras they make up mixes and sell these at the same price as the cheapest breed in the mix. The only problem is telling who is who when they hatch. But I found this page which includes pictures of different breed chicks - very handy! Hmmm, something else I do on rainy days is stick on a kiddy DVD when it all gets too crazy. It lets them chill out and if I'm lucky (and have already got dinner on the go) I can sneak in a little browsing. I've only spent a little while, but what it seems to be about is members posting instructions for just about ANYTHING you can think of. I was looking for a free fabric grocery bag pattern....well, there's heaps. And it seems there is also a million things you can do and make with plastic grocery bags too!! Who knew ! There is also forums on being green, crafts, events, games, kids....the list goes on. And an interesting section where you can ask other members burning questions you need to have answered. Like this one: "How can I remove the diodes from a modern television flyback transformer?" Must confess to not knowing the answer to this one!! It's raining here today, and not just a drizzle, I mean really raining. And cold, so we can't even put our coats on and splash in puddles. Just too horrible. Put all the dry ingredients into a big bowl, then add the oil and boiling water and mix well OR dissolve the salt in the water first so you don't get that grainy texture then mix in everything else. Knead well. I then divide it up into 3 or 4 lumps, flatten these and drop different food colours onto each. Fold the dough over the colouring and knead it in. Add some cookie cutters, a rolling pin, some old butter knives etc and hey presto, hours of entertainment! After play, put it into a plastic shopping bag and squish ALL of the air out and it will last for ages. And a word of advice - don't EVER chuck old playdough out where chickens can eat it. They will, and then they will die (don't ask me how I know). Talk about nostalgia. My Sis posted a recipe on her blog for Gingerbread Witches that we used to make as kids so, of course, I couldn't resist trying them out again. But I couldn't be bothered to make up a Witch template so mine are the good old fashioned Men shape (albeit a bit mini, I found that cutter at a junk emporium).